List of waiting candidates for the session 2018-2019. Admission is on the basis of merit. Criteria prescribed by Ministry of Health & Family Welfare and Bangladesh Medical & Dental Council (BMDC) are followed. Applications for the session 2018−2019 will be invited by the Director Medical Education, Government of Bangladesh. The admission test will be organized and conducted by the Director Medical Education for both government and private medical colleges. 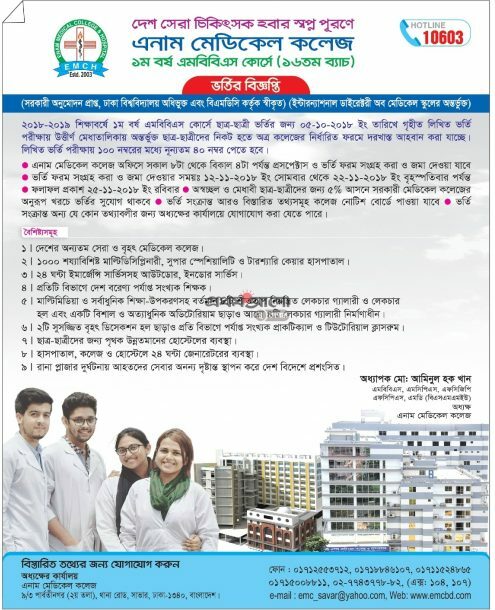 Students who passed SSC or equivalent examination in science group in the year 2014 and 2015 and HSC or equivalent examination in science group with Physics, Chemistry and Biology in the year 2016 and 2017 from any recognized board or University of Bangladesh obtaining total GPA 9 and having Biology with minimum GPA 3.5 in HSC are eligible to apply. Those who have passed ‘O’ and ‘A’ level or equivalent examinations in the specified years having equivalent marks are also eligible to apply with an equivalence certificate from Director Medical Education, Mohakhali, Dhaka. Applications are to be submitted to the government medical college as per circulation in the daily news papers by Director Medical Education. The admission test will be held on same date and time for both government and private medical colleges with same question. Separate list will be published through internet or daily newspapers by the Director Medical Education from the candidates who have given option for admission in private medical colleges. The eligible candidates as will be announced by the Director Medical Education shall have to apply to the Principal of private medical colleges for admission according to their choice. The candidates from this list will be eligible to apply to Enam Medical College for admission and also other medical colleges if they desire. However, the final selection for admission will be made on the basis of national merit position. The selected candidates will be examined by a medical board for their physical fitness. The medical board will be formed by the Principal of Enam Medical College. The candidates and their parents or guardians are required to sign bonds on non-judicial stamp regarding the terms and conditions of study, conduct and discipline during admission into the college. Tuition fees and all other fees payable at the time of admission will be notified in the college notice board. Tuition fees and hostel seat rent are payable within 15th of each month after which a fine of Tk. 10/= for each day of delay will be charged. All payments made at the time of admission are non-refundable and even after cancellation of admission. Any student seeking to leave the college any time after admission will have to pay an additional amount of Tk. 60,000/- (Sixty thousand) only as compensation to the college. Moreover, he or she will have to pay the remaining full tution fees of total 5 years period. Free studentship is available for some meritorious and financially insolvent students. Separate applications are to be submitted for this category. Five percent students will enjoy free studentship. The college governing body will select the candidates for this quota of 5% meritorious and insolvent students. Foreign students should have minimum total GPA 7.0 in SSC and HSC in case of A level and O level. The marks are to be verified and approved and to get an equivalence certificate for eligibility by the office of Director Medical Education, HMPD, DGHS, Mohakhali, Dhaka on payment of fees. They should apply in the months of September to November and send their own foreign ministry attested copies of marks sheet, photographs and other required papers through Embassy of Bangladesh in their countries or through their own foreign ministry. However, the whole admission process may also be helped or handled by some Education Consultancy farms or organizations in their cities or countries. At the time of admission the original documents are to be submitted and will be retained by the college.